Aid agencies have a duty of care to respond to incidents of sexual violence against their staff. Sexual violence in all its forms violates human rights. Incidents of this kind are deeply distressing for the survivor, their family, their colleagues and the whole aid community. Sexual violence incidents also have the potential to leave survivors with lifelong physical and mental health problems. 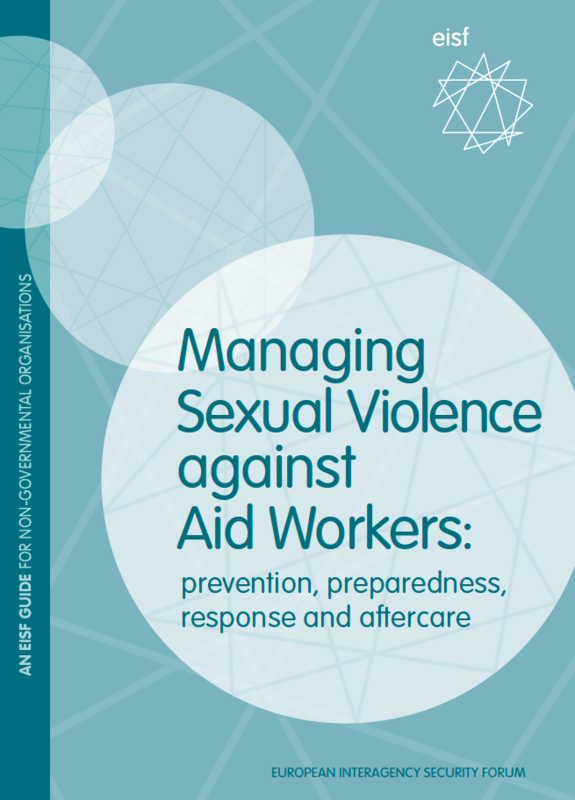 Managing Sexual Violence against Aid Workers aims to support aid agencies in preventing, being prepared for and responding to incidents of sexual violence against their staff. It is intended as a good practice guide to help strengthen existing processes and support organisations as they set up their own protocols. This guide is aimed at anyone with a responsibility for staff care, safety and security, as well as anyone involved in processes aimed at preventing or responding to incidents of sexual violence against staff, such as security focal points, HR staff, project and programmes staff, and first responders to incidents of sexual violence within an aid organisation. The full guide and a summary brief can be accessed via the links below. The associated tools can be downloaded in an editable format using the links below, and organisations are free to use or adapt these tools provided that EISF is acknowledged as the original source.